Each client has a unique mission, organization, and history; so we strive to create projects that strongly reflect your specific identity and goals. Using proprietary tools, we help identify your actual needs and opportunities. We then work within your projected budget to recommend a solution. Please contact us for a free evaluation of your own, unique, project. 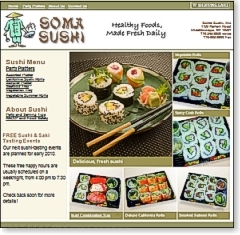 A wholesale provider of sushi for schools, hospitals and caterers, Soma serves only sashimi-grade seafood, the highest quality available. The company is also one of few local companies whose products are completely HACCP certified for food safely. Marketing features for this site include an online shopping cart and quarterly e-newsletters. "CHOICE: Careers in Healthcare - Opportunities in Choosing Employment" reaches at-risk youth through a series of live interactive vignettes that encourage students to consider and pursue careers in healthcare. Among other features, the CHOICE site includes printable career-planning journals, developed by education professionals, for students at both intermediate and commencement levels. 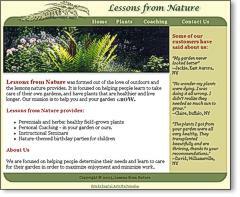 Based on a decades-long love of nature and the outdoors, the proprietor of Lessons From Nature decided to create a business centered around nature parties, personalized garden coaching, and the sale of field-grown plants. The Lessons From Nature site features a straightforward, down to earth design that reflects the personality of the company and its services. With over twenty years experience, Business Theatre Works has offered workplace training services to many different clients, including major corporations, government agencies and non-profits. 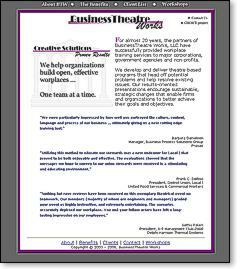 The BusinessTheatre Works site gives details on how their theatre-based workplace training programs head off potential problems; help resolve existing issues; and encourage sustainable, strategic changes that enable firms and organizations to better achieve their goals and objectives. Edgy, provocative theatre has found a new home in Buffalo. 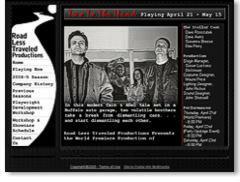 Road Less Traveled Productions showcases some of our region's most talented new theatre professionals, including playwrights Jon Elston and Darryl Schneider. The Road Less Traveled site offers visitors a glimpse of the taut, dark vistas opened up by these adventurous writers. The site is rendered in a dark monochrome, so the stark images of the company's identity graphics shine through.